I’m going out on a limb here, but I’m willing to bet that your wedding photographer wants to knock your socks off. I know that I take great pride in my work and it is my goal to not only meet, but to EXCEED all of my clients’ expectations on their wedding day. I am an extremely open + honest person, so I do my best to communicate with my brides throughout the process so that on their wedding day, we are set up for success. The last thing I want is for one of my brides to feel let down when they finally get their online gallery. But I’m realistic enough to know that it’s bound to happen. Your wedding day is extremely dynamic, with a ton of moving parts and elements that are out of the photographers’ control. Being a wedding photographer demands that you are extremely flexible, work well under pressure, a great problem solver, and quick to act – and that’s what I absolutely LOVE about wedding photography. It’s always an adventure! However, it’s important to keep in mind that your wedding photographer is only able to work with what they are given, in the time frame they are given. We are NOT miracle workers and at the end of the day, we ARE human. With that in mind, I thought it would be good to write about the things that you can do before the wedding, to ensure that you + your photographer are on the same page and that you are doing everything possible to create a situation and atmosphere that is conducive to creating beautiful portraits on your wedding day. Prioritize your photo list + let your photographer know what is most important to you. I always have my clients fill out a questionnaire before their wedding day and they rank, on a scale of 1-5, the importance of their family formal/group photos, bridal party photos, and bride + groom portraits. This helps me understand what’s the most (and least) important to them so I can keep that in the back of my mind throughout the day. Discuss your timeline with your photographer as early as possible. If portraits are important to you, you’ll want to make sure you discuss your timeline with your photographer well in advance, even before choosing a ceremony time! Your photographer understands light better than anyone else on your wedding team and they will play a crucial part in helping you create a timeline that works around the sun – which is probably the most important part in creating beautiful images on your wedding day. Consider a First Look. Especially if portrait time with your groom is important! The First Look adds so much valuable photo time to your wedding day and gives us so much more flexibility when it comes to the timeline. It just creates such a laid back atmosphere for the day and allows us to really take our time with photos. In my perfect world, everyone would do a First Look! Give your photographer as much portrait time as possible. Without a First Look, most photographers only have an hour for portraits on your wedding day – and during that time, your friends + family are more interested in getting things “over with” and getting to the party, which creates even more stress on your wedding photographer. If you won’t consider a First Look and still want a lot of portraits, consider extending cocktail hour or creating a separate cocktail hour area for your friends + family who will need to be present for formal portraits. At least that way, they’ll be able to “party” while waiting their turn for photos! Chat with your photographer about location options. Most photographers know the best spots at any given venue for photos. 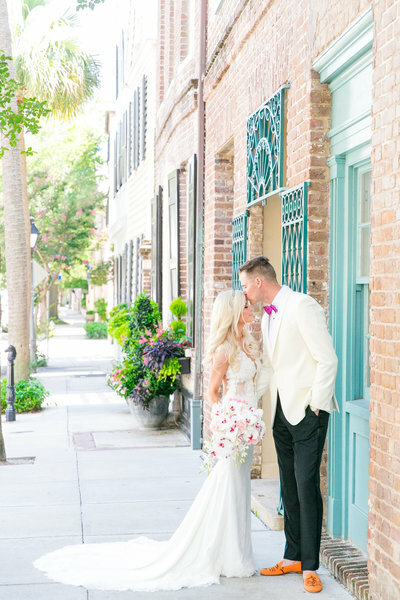 If you have your heart set on a certain location, discuss with your photographer so they can give you their input into the timeline – they will know when the lighting is just right! Consider nearby locations, not just the ones on-site. This is HUGE! Most clients don’t even consider this option, but jumping in the car/trolley/bus and taking a short ride to another location may just be the answer to finding the BEST possible location for portraits! Be prepared with a feasible Plan B in the event of inclement weather. Unfortunately, your photographer cannot control the weather. If you’ve chosen to work with a natural light wedding photographer (like me), you’ll want to plan ahead to find a suitable location to use for photos in the event of rain. In my case, I greatly prefer indoor locations with ample NATURAL light or somewhere outdoors that is covered, like a porch or portico. This will ensure that your portraits maintain that light + airy feeling you see on my website. If I can avoid going indoors + using flash, great! Ask friends + family to put their phones + cameras away. During portrait time, it’s not uncommon for a swarm of people to stand beside me or behind me with their phones + cameras, snapping away. While I don’t mind them taking their own photos, I DO mind them competing with me for my clients’ attention. When photographing large groups of people, it is hard enough to wrangle everyone and pose them. Throw in peoples’ natural tendency to blink, yawn, make a weird face… it’s really difficult to do these larger group photos quickly! If everyone is looking in a different direction, it makes it near to impossible to create that “perfect” formal photo with everyone looking at me + looking nice. So during portrait time, please ask your guests to put away their own cameras + phones so that everyone can focus on your wedding photographers’ lens. Consider hiring a wedding stylist or asking one of your friends to act as one during portraits. Your wedding photographer has SO MUCH running through their head on a wedding day. They are constantly thinking 5 steps ahead of themselves, juggling the timeline, shot list, family dynamics, remembering names… all while trying to maintain a calm presence about them. My mind naturally focuses on the big picture throughout the wedding day and, as hard as I try, sometimes those small details slip my mind. That’s where having a wedding stylist or a close friend acting as one during portrait time would be SO handy!! They could act as my second set of eyes, to make sure that the small details aren’t overlooked. Details like: is the dress laying nicely? Are the guys’ boutonnieres on straight? Is everyone looking at the camera? Does Mom need more lipstick? Is Uncle Joe making a silly face? Does the dress fit well? Like I said, I do my best to check these details before taking photos, but sometimes they slip through the crack. Having someone else there to focus on those details would be FABULOUS!! Keep light in mind. Great portraits demand great light. Most natural light wedding photographers prefer to use open shade and to photograph portraits within 2 hours of sunset. It’s important to remember that if the day is overcast, everything will get darker more quickly – but your photographer will also be able to shoot just about anywhere, as the light will be consistent + even no matter the location. Always remember – if your photographer has a light + airy style, they will need similar conditions to product similar looking images for you. So those are a few tips I’ve come up with that will ensure that you + your wedding photographer are set up for successful portraits on your wedding day. If anyone has other suggestions, please feel free to leave them in the comments below. In the end, I think it all comes down to effective communication and setting realistic expectations along the way!